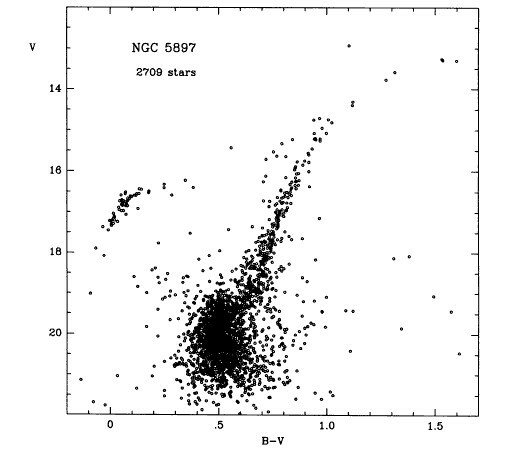 author Ferraro, F. R.; Fusi Pecci, F.; Buonanno, R.
Globular Cluster NGC 5897 was discovered by William Herschel, probably on April 25, 1784 when he logged his H VI.8 with an inacurate position, but with certainty on March 10, 1785 when he cataloged it as H VI.19. With its visual brightness of about 8.5 mag, this is a fairly bright and fine object for telescopes of any size. It is situated about 5deg NE of Sigma Lib (mag 3), and 8deg SW of Alpha Lib. Clement, Christine M.; Rowe, Jason F.
Ferraro, F. R.; Fusi Pecci, F.; Buonanno, R.